This paper contributes to the debate on the relationship between public and private investment in India along the following dimensions. First, acknowledging major structural changes that the Indian economy has undergone in the past three decades, we study whether public investment in recent years has become more or less complementary to private investment in comparison to the period before 1980. Second, we construct a novel data-set of quarterly aggregate public and private investment in India over the period 1996-2015 using investment-project data from the CapEx-CMIE database. Third, embedding a theory-driven long-run relationship on the model, we estimate a range of Structural Vector Error Correction Models (SVECMs) to re-examine the public and private investment relationship in India. Identification is achieved by decomposing shocks into those with transitory and permanent effects. 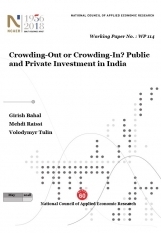 Our results suggest that while public investment crowds out private investment in India over the period 1950-2012, the opposite is true when we restrict the sample to post 1980 or conduct a quarterly analysis since 1996. This change can likely be attributed to the policy reforms which started during early 1980s and gained momentum after the 1991 crisis.